It has been nearly 34 years since I picked up my first cigarette in the sixth grade. I remember being intrigued by the television commercials aimed at women (You’ve Come a Long Way Baby) and I truly believed that it made me look sophisticated. By the time I graduated from high school, I was smoking a full pack of cigarettes every day. In my twenties I decided to quit smoking. It lasted about three days, before I went back to smoking more than I did to begin with. I loved smoking, but I detested being a smoker. Throughout my thirties, I began having trouble with chronic bronchitis. 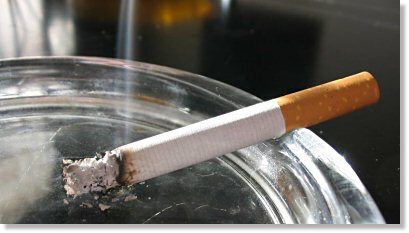 The doctors warned me repeatedly that if I did not quit smoking, I would die of emphysema at a very young age. I went through two more attempts to beat this powerful addiction. I tried patches, and nicotine gum, and at times, both at the same time. Again, I failed and my smoking only increased. The guilt of failure was overwhelming. I was humiliated to admit that again I had failed. I would actually hide behind the dumpsters at work to sneak a cigarette, scared to death that someone would see me. Even my daughter looking into my eyes and begging me to quit smoking did not give me the power to beat this horrible addiction. By the time I hit forty, I was a three pack a day smoker. I was so ashamed that I would not admit it to anyone, including my doctors. Through it all, I kept to the story that I smoked about a pack a day. Zyban did nothing to help me, except make me feel like crap. About this time, with tears streaming down my face, I got down on my knees and literally begged God to give me the strength to overcome this. I could not understand how it was possible that I had overcome every challenge I had ever faced in my life, but I could not beat my addiction for nicotine. I am now 45 years old and breathing has become a struggle. I smoke an average of four packs daily, even though I spend hours a day coughing. I know in my heart that this is my last chance to quit, or I will not live to see my daughter graduate from high school. Why, after all these years am I now willing to admit my utter shame and tell this story publicly? Because I want to reach out to others that might be out there, just like me. I want to tell my story. I have made the DECISION to quit smoking, no matter what it takes. By making my decision and my story public, knowing that others may be reading who might be praying (like I was) for strength, maybe I can help them believe it can be done. I am going to blog about my journey throughout this decision often. If it helps even one person out there, it will be worth it.